On Wednesday, February 25th, 2004 at 2:23 PM (PST) we recorded a quake (preliminary ml 3.8) located near San Jacinto. Initial source parameters for the recent event are shown below. The epicentral distance (distance separating the epicenter and the closest station in the recording network) for Anza is 34 km (0.31 degrees). Due to strong electrical storms in the Anza-Borrego region of San Diego we have not been receiving realtime data from many of the Anza broadband stations since Saturday February 21st, 2004 due to one of our relay stations being struck by lightning. 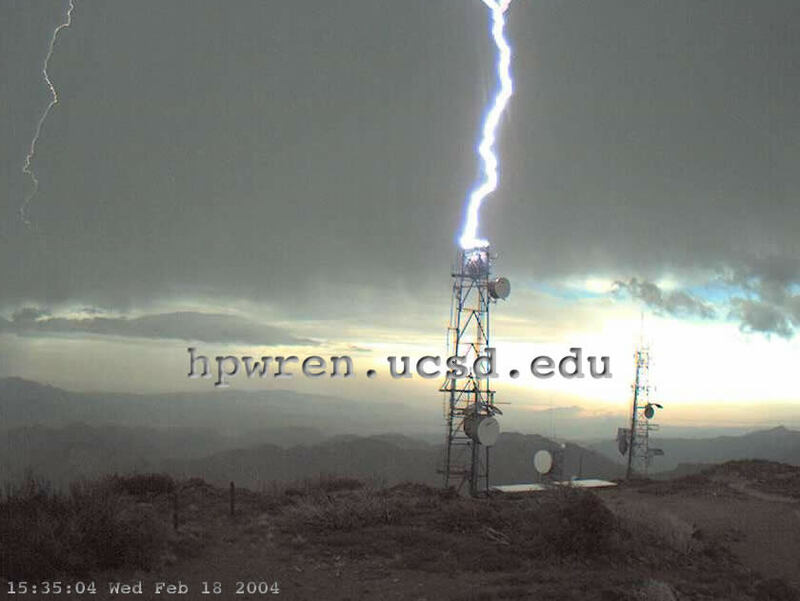 Click here to see a photo taken in the afternoon of Wednesday 18 February 2004 that shows one of the Anza stations being struck by lightning (photo courtesy and © of hpwren.ucsd.edu). We operate a broadband station on Mt. Soledad. At 14:23 (PST) station SOL recorded the P wave from this event. Here is a view of that event as picked by our analyst. A pink "P" indicates a P wave arrival, a pink "S" indicates an S wave arrival.